Neurology India (ISSN 0028-3886) is quarterly publication of Neurological Society of India. 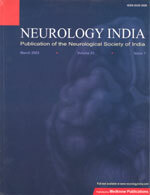 Neurology India, the show window of the progress of Neurological Sciences in India, has successfully completed 50 years of publication in the year 2002. "Neurology India", along with the Neurological Society of India, has grown stronger with the passing of every year. This specialty journal reaches to about 2000 neurologists, neurosurgeons, neuro-psychiatrists, and others working in the fields of neurology. The journal is also subscribed by major hospitals and colleges in India.